This article is about the 98th Bombardment Wing of World War II. For the 98th Bombardment Wing established in 1947, see Nevada Test and Training Range (military unit). This article is about the 3d Air Division (Bombardment) of 1947-1949. For the 3d Air Division of World War II and Strategic Air Command, see 3d Air Division. The 98th Bombardment Wing is an inactive United States Army Air Forces unit. Its last assignment was with the United States Air Force Reserve, based at Bedford Field, Massachusetts. It was inactivated on 27 June 1949. As the 3d Wing, the unit was one of the original wings of the GHQ Air Force on 1 March 1935. It was formed in Texas, reassigned to Barksdale Field, Louisiana. Performed peacetime training operations. Assigned to MacDill Field, Florida, 1940 and assigned to USAAC Southeast Air District, becoming part of III Bomber Command just prior to World War II. 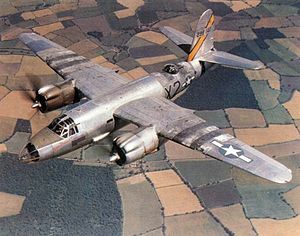 It was deployed to England and was reassigned to VIII Bomber Command in June 1942 as a medium Bomber command and control organization component units being equipped with B-26 Marauders. It served postwar as an Air Force reserve unit, 1947–1949. Inactivated on 27 November 1945.